What is a Care or Supervision order? A local authority may seek a court order if it is alleged your child is not receiving the sort of care it would be reasonable to expect from a parent, and this lack of care is causing your child significant harm. If you receive notice of court proceedings you should contact us immediately. 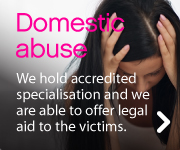 Here at DS Legal, our specialist legal team has decades of experience dealing with court proceedings and care orders. We can help you to become fully aware of your rights and advise you on whether the actions of the local authority are fair and just. The social services department’s primary duty is to work with you as parents and with your child to prevent your child being made the subject of a care order, or to return your child home as quickly as possible. If the local authority make an application to the Family Court . The court will appoint a person to look after the child’s interest during the court proceedings. This person is known as the children’s guardian. if you are involved in care proceedings you need to contact us immediately. You and your child can each apply for help with legal costs, and will be entitled to get this help without meeting the usual conditions. How long will the care order last? A care order can last until your child is 18 years and it is therefore very important that you get the right help at the outset. If you would like to discuss any aspect of care proceedings or social services involvement, please call Mark or Lauren on 01242 517949, 01792 892692 or 01993 220651. Alternatively, please email us at enquiries@ds-legal.co.uk. We’re here to help.